You and your friends can party like rock stars with our Band on the Run Inflatable Kit! Our 24-piece inflatable band kit includes all the blow up instruments you need to rock the night away, including four 42-inch regular guitars, four 42-inch V shaped guitars, four 24-inch saxophones, four 14-inch bongo drums on a strap, four 24-inch keyboards, and four 10-inch microphones. This inflatable instrument kit is perfect for birthday parties, Bar or Bat Mitzvahs, musical theme parties, karaoke night, and any other event where you want to add an extra element of fun to the evening! Our 24-piece Band on the Run Inflatable Kit is sold by the kit. Colors and styles may vary. INFLATA-BAND: Your air guitar skills just got REAL and your band is about to BLOW UP! Our rock band inflate instrument set brings the excitement of the concert hall to your living room, featuring inflatable instruments to equip your kids or friends for a legendary night of make believe rock n' roll! MUSICAL PARTY DECORATIONS: Your musical party theme is about to get an encore! Our inflatable music props make melodious musical party décor or inflatable musical band instruments for your after school theatrical production. Whatever the application, our inflatable instruments for kids are sure to strike a chord! ROCKIN' BIRTHDAY & CHRISTMAS PRESENTS: This inflatable instruments set makes a high-voltage rockin' gift that any rock-crazed teenager is sure to head-bang or raise their devil's horns hand gesture to in genuine appreciation. 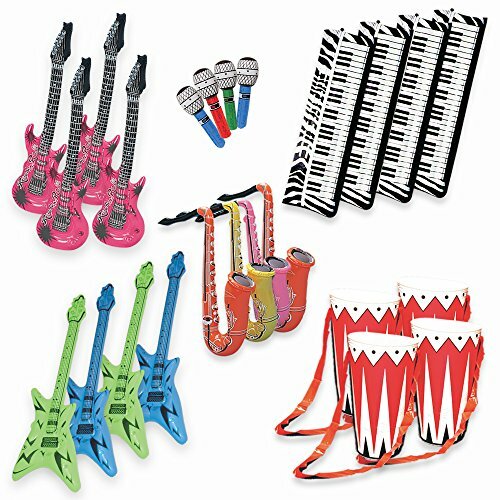 INFLATABLE INSTRUMENTS PARTY FAVORS SET: Hand these musical party toys as musical party favors that are sure to inspire awe-inspired anthems! If you have any questions about this product by Windy City Novelties, contact us by completing and submitting the form below. If you are looking for a specif part number, please include it with your message.